Here in Spain, it is not unheard of to hear someone saying that his or her grandmother was preparing big batches of croquettes over the weekend, especially around the holidays. And croquettes are often on the menu at a tapas bar. I used to wonder why one would dedicate so much time to making them. I remember trying a few in some bars and they were ok. 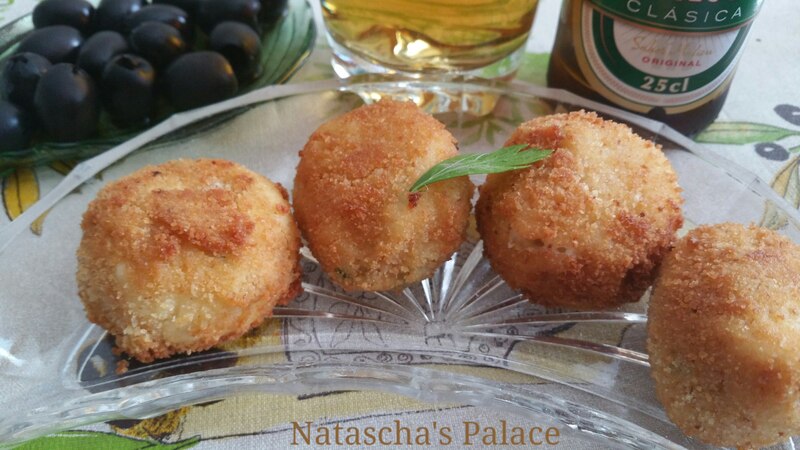 Yes, just ok. Well, this week I decided to make bacalao croquettes from scratch in order to discover if they really were worth the time and effort. My parents were coming to visit and I wanted to surprise them. 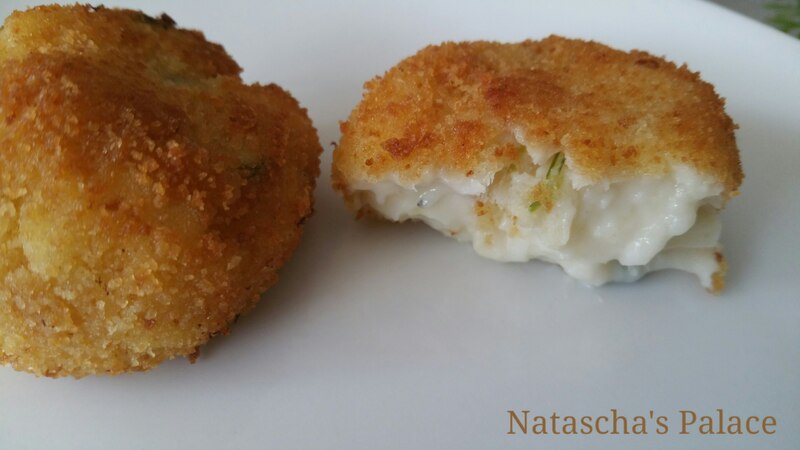 I have learned that salted cod is not as bad as I thought it would be and that croquettes are wonderful! They are not a quick to make but the results are super. I hope you enjoy these too. 1. Heat the olive oil on low heat in a small deep pot.Add the garlic and chives. Stir frequently until transluscent. Add the bacalao and stir in briefly. 2. Add the flour and stir in gently. Gradually add the milk, stirring constantly. Increase the heat to medium and stir for about 20 minutes. Do not be tempted to add more flour because it appears liquidy. In 20 minutes, it really does transform. Just be patient. It will be even thicker when it cools down. 3. After the 20 minutes, add the parsley and salt/pepper if needed. Transfer to a large bowl. When it cools down a bit a forms a firmer surface, brush a thin layer of olive oil over it. Cover it with plastic wrap and put it in the fridge overnight. 4. The next day, set up your station. 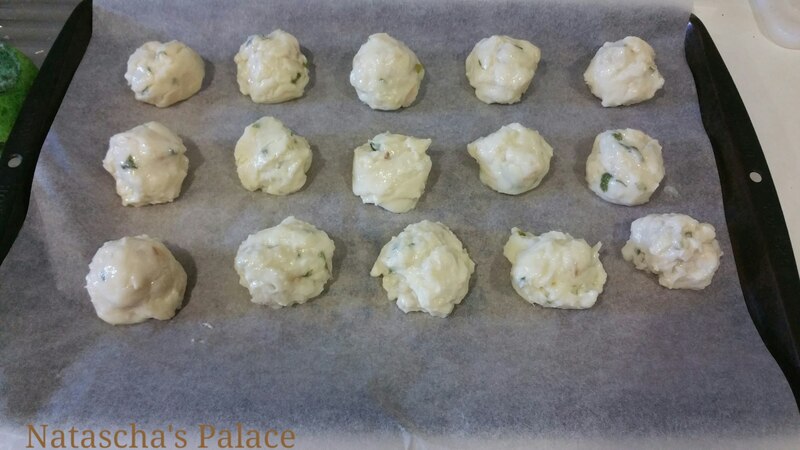 Have a paper lined tray to put the croquettes when you make the shapes. I made mine round using a tablespoon. 5. Have a small bowl of flour ready. Make sure you have your 3 beaten eggs in a small bowl. Put a generous amount of bread crumbs in another bowl or plate. Have another parchment paper covered baking tray ready. Then line up your station in this order. 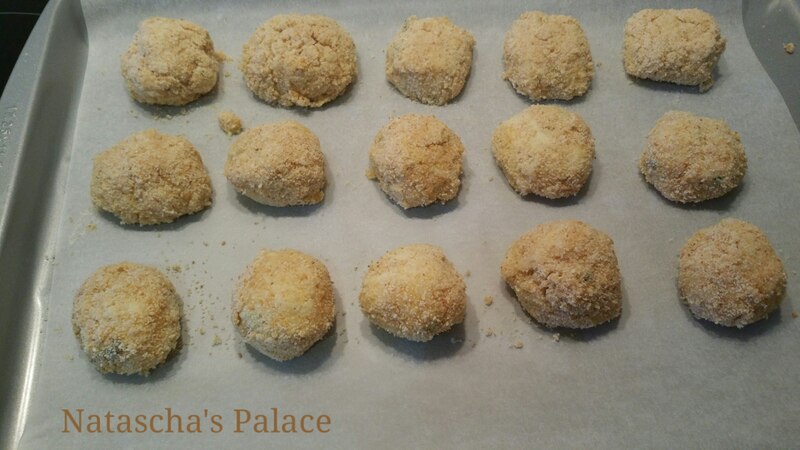 Now begin by taking a croquette, rolling it in the flour, dippping it in the beaten egg, then rolling it in the bread crumbs. Put it on the baking tray and repeat. 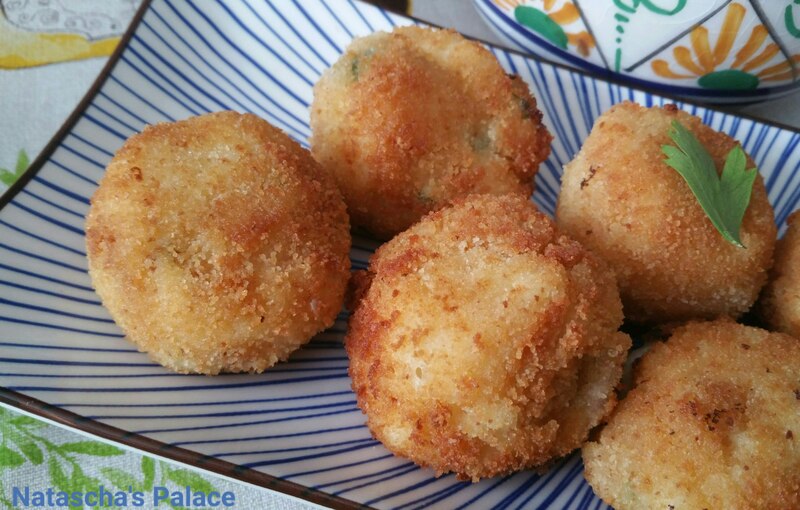 Important: Leave the croquettes to “set” on the tray for at least half an hour! This prevents them from falling apart. Meanwhile, set up another baking tray lined with paper towels. 6. Heat the olive oil in a deep frying pan. Put in a generous amount. 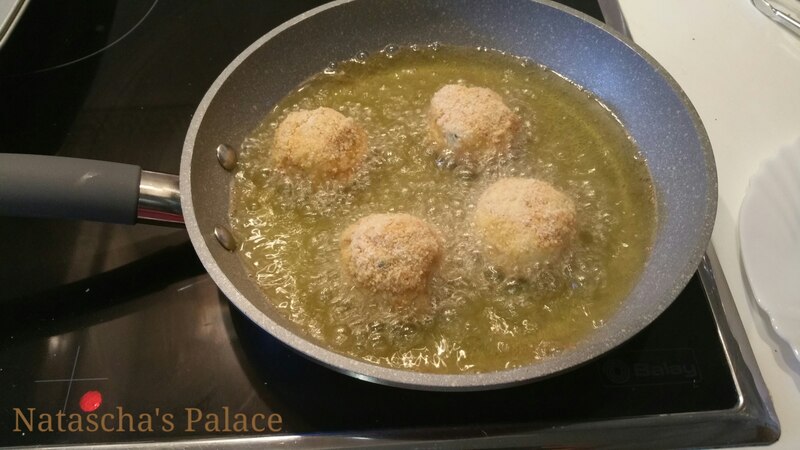 I am sorry for being a bit vague here but I put enough so that when I put in the croquettes they were more than halfway covered in oil. Heat the oil on medium high heat. I fried them for about 2 minutes on each side. I used one croquette as a tester to see how long it would take. You might want to as well because frying pans and ovens are different. Also, the size of your croquettes affect cooking time. I don’t want to insult your intelligence by telling you things you already know. It is just that I am learning and maybe some of these tips will help you too. Fry 4 or so at a time. Don’t crowd them. 7. When the croquettes are ready, put them on the paper towel lined tray to drain them. Repeat process until all croquettes are done. 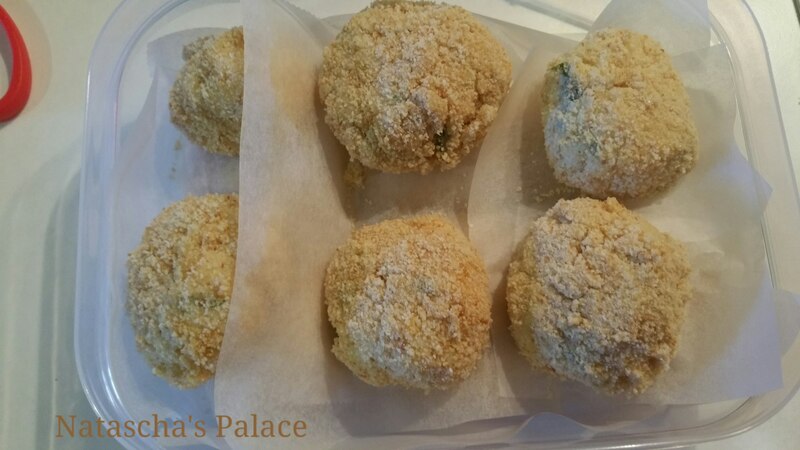 Freezing instructions: After leaving the croquettes to set, catefully arrange them in a parchment paper lined container. It is important that they do not touch each other because they could stick. I put extra parchment paper, just in case. When you are ready to defrost them, do not defrost them. Just heat the oil at the same temperature as you would when frying fresh ones. They will take a bit longer to make but turn out just as good! Very interesting for me to see this! I am sure it is very good!